Get your guns! Take a page out of Biggie's book and learn how he prepares his biceps and triceps for an important contest. Here's to volume! I like to do this arm workout every six days about a month before a contest. It won&apos;t necessarily make you stronger, but it&apos;s going to add a lot of volume to your muscles, allowing you to stand apart from your competition. This workout will also deplete the muscle of glycogen, which allows us to tap into our fat cells a little faster. Less fat, bigger guns—what&apos;s not to love about this arm thrash? This workout consists of eight exercises: four biceps movements and four triceps movements. I like to blast these muscles from every angle. I&apos;ve been focusing on isolation movements lately, and I&apos;ve found that my biceps and triceps have grown since I started keeping my shoulders, back, and core out of the movements. Go hard and demand a lot from your muscles. It&apos;s the only thing that will make them grow and change. Don&apos;t do too many reps for your warm-up set, just five slow reps will do. During the working sets, increase the weight as you decrease the reps; that way your muscles will reach failure each set. Keep your shoulders retracted so they don&apos;t take over the movement. Don&apos;t swing too much—you can cheat a little bit, but not a lot. Control the movement by concentrating on the negative as well as the positive. In the past, I did this movement really heavy with an EZ-bar. I find that dumbbells allow me to contract the muscle better. I&apos;ve been getting better growth and better stimulation from the muscles using dumbbells. Going too heavy stresses your tendons. 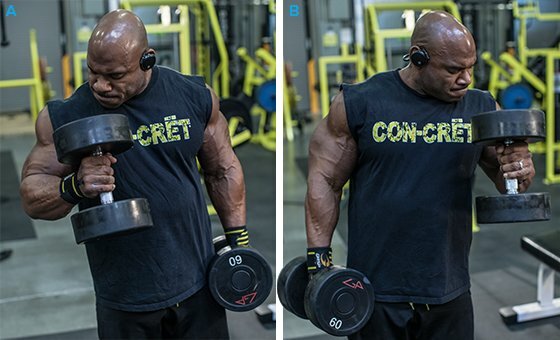 As with hammer curls, increase the weight each set. Again, increase weight each set. Go heavy as possible, but keep and maintain good form. When you start using too much weight, you&apos;ll use other muscles to do the lift. I like to do this movement standing so I can concentrate on getting my arm in a good position and not rely on my back or core to do the work. One of the goals pre-contest is to maintain density. That&apos;s why I like to do a compound movement like this. To do the exercise correctly, retract your shoulders by squeezing your shoulder blades together and keep your elbows in. You want the stress to be solely on your triceps. Leave your chest and shoulders out of it. Bring the weight down to the lower part of your sternum and then straight back up. 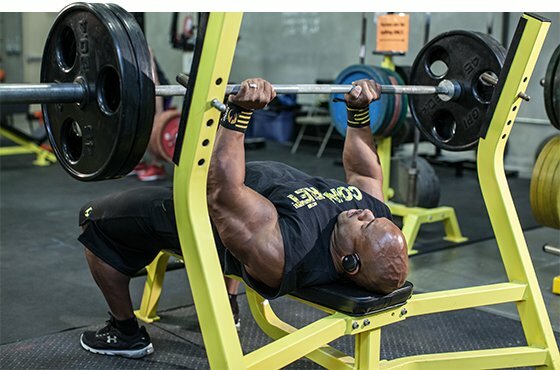 Increase the weight each set. Tired yet? Regardless, keep your rep range moderate and your weight heavy. Keep your armpit up a little and put your elbow on the pad. Get a full extension and a full contraction. The isolation will produce great results. I love this exercise because it&apos;s easy on the joints, and I&apos;m able to feel all heads of my triceps while I&apos;m doing it. Like all other triceps movements, keep your shoulders retracted so they&apos;re not part of the movement. If you start fatiguing and you&apos;re training by yourself, strip some weight so you can finish the set. With this exercise, I can stay controlled. I put the handle in my fingers so my biceps—not my forearms—do the work. Try doing this movement to the side instead of straight down. That way the emphasis is on the medial and long head of your triceps. Thick medial and long heads will show up when you hit that double-back biceps pose. That&apos;s not a problem. This workout can still be useful. If you&apos;re not getting ready for a contest and you&apos;re trying to put on size, feel free to bring those rep-ranges down to the 8-12 range. Fewer reps and heavier weight will send your biceps and triceps the muscle-building memo!